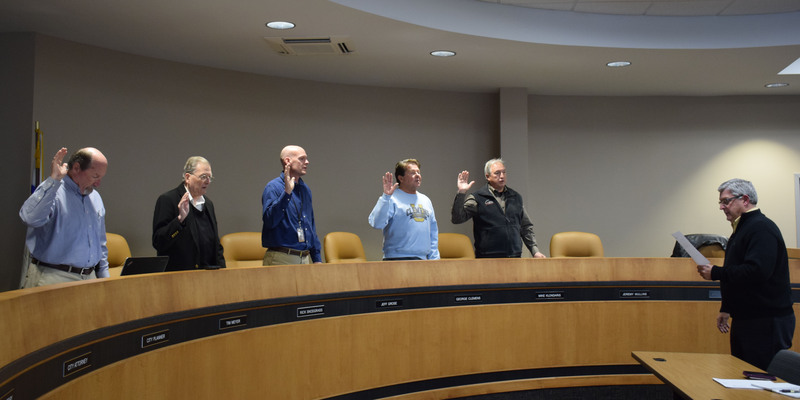 Standing, from left, are Tim Meyer, Rick Snodgrass, Jeff Grose, George Clemens, Mike Klondaris and Mayor Joseph Thallemer during the official swearing in ceremony. WARSAW — Board members were sworn in and elected officials were appointed before talk of 2017 projects at the Redevelopment Commission held on Monday, Jan. 9. Warsaw Mayor Joseph Thallemer swore in Tim Meyer, Rick Snodgrass, Jeff Grose, George Clemens and Mike Klondaris as the 2017 board members. Jeremy Mullins will also be on the board as a school representative but was not present at the meeting. The board members then elected TIm Meyer to president and Rick Snodgrass to vice president without any objections. A bid has officially been awarded to G&G Hauling and Excavating, Inc. for the CR 300N project. City Planner Jeremy Skinner said the bid is about $70,000 less than the original estimate. The council approved the bid awardment. A final contract with HWC Engineering was proposed for work on the Gatke property and a mixed-use property downtown. The contract, while worked on last year, was held until the first meeting of 2017 for budget reasons. The board approved the contract. Skinner announced that three major projects are expected to begin in 2017. Construction on the CR 300N project is expected to start in the spring. Construction and bid letting on the Buffalo Street project will begin around March. Bid letting on the Husky Trail project will happen later this month. And phase two of the technology park is also expected to start this year. The board estimated that around $6M in infrastructure will take place this year, with a good chunk of it coming from grants. An update was given on the Market Street project. The project is still in the engineering phase and construction won’t begin until 2018. Claims of $40,885.46 were approved. The next meeting will be held at 4 p.m. on Monday, Feb. 6 at City Hall.